See the document Multicompartmental models (Brian 1 –> 2 conversion) for details how to convert Brian 1 code. 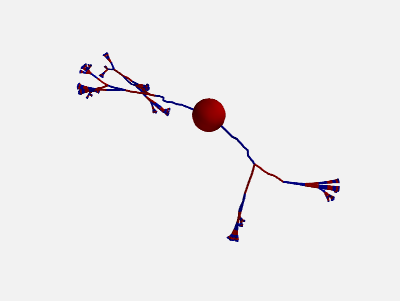 It is possible to create neuron models with a spatially extended morphology, using the SpatialNeuron class. 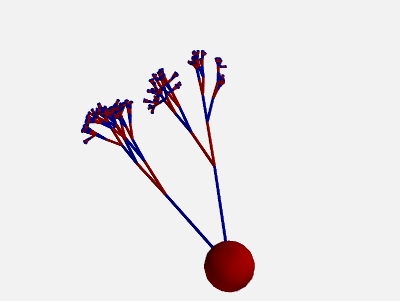 A SpatialNeuron is a single neuron with many compartments. 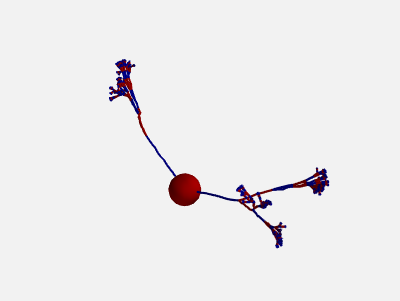 Essentially, it works as a NeuronGroup where elements are compartments instead of neurons. A SpatialNeuron is specified by a morphology (see Creating a neuron morphology) and a set of equations for transmembrane currents (see Creating a spatially extended neuron). The first statement creates a single iso-potential compartment (i.e. with no axial resistance within the compartment), with its area calculated as the area of a sphere with the given diameter. The second one specifies a cylinder consisting of 10 compartments with identical diameter and the given total length. The individual compartments are modeled as truncated cones, changing the diameter linearly between the given diameters over the length of the compartment. Note that the diameter argument specifies the values at the nodes between the compartments, but accessing the diameter attribute of a Morphology object will return the diameter at the center of the compartment (see the note below). For a Section, the diameter argument specifies the diameter between the compartments (and at the beginning/end of the first/last compartment). the corresponding values can therefore be later retrieved from the Morphology via the start_diameter and end_diameter attributes. The diameter attribute of a Morphology does correspond to the diameter at the midpoint of the compartment. For a Cylinder, start_diameter, diameter, and end_diameter are of course all identical. Note that an expression such as morpho.L will always refer to the entire subtree. However, accessing the attributes (e.g. diameter) will only return the values for the given section. The number of compartments in a section can be accessed with morpho.n (or morpho.L.n, etc. ), the number of total sections and compartments in a subtree can be accessed with morpho.total_sections and morpho.total_compartments respectively. This algorithm will base the orientation of each section on the orientation of the parent section and then randomly perturb this orientation. More precisely, the algorithm first chooses a random vector orthogonal to the orientation of the parent section. Then, the section will be rotated around this orthogonal vector by a random angle, drawn from an exponential distribution with the \(\beta\) parameter (in degrees) given by section_randomness. This \(\beta\) parameter specifies both the mean and the standard deviation of the rotation angle. Note that no maximum rotation angle is enforced, values for section_randomness should therefore be reasonably small (e.g. using a section_randomness of 45 would already lead to a probability of ~14% that the section will be rotated by more than 90 degrees, therefore making the section go “backwards”). The algorithm is the same as the one presented above, but applied individually to each compartment within a section (still based on the orientation on the parent section, not on the orientation of the previous compartment). To manually create a morphology from a list of points in a similar format to SWC files, see Morphology.from_points. Morphologies that are created in such a way will use standard names for the sections that allow for the short syntax shown in the previous sections: if a section has one or two child sections, then they will be called L and R, otherwise they will be numbered starting at 1. Note that the x, y, z attributes of Morphology and SpatialNeuron will return the coordinates at the midpoint of each compartment (as for all other attributes that vary over the length of a compartment, e.g. diameter or distance), but during construction the coordinates refer to the start and end of the section (Cylinder), respectively to the coordinates of the nodes between the compartments (Section). 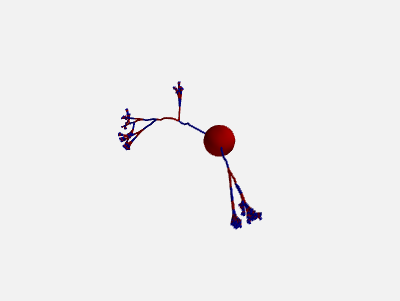 In the majority of simulations, coordinates are not used in the neuronal equations, therefore the coordinates are purely for visualization purposes and do not affect the simulation results in any way. Coordinate specification cannot be combined with length specification – lengths are automatically calculated from the coordinates. The coordinate specification can also be 1- or 2-dimensional (as in the first two examples above), the unspecified coordinate will use 0 μm. All coordinates are interpreted relative to the parent compartment, i.e. the point (0 μm, 0 μm, 0 μm) refers to the end point of the previous compartment. Most of the time, the first element of the coordinate specification is therefore 0 μm, to continue a section where the previous one ended. However, it can be convenient to use a value different from 0 μm for sections connecting to the Soma to make them (visually) connect to a point on the sphere surface instead of the center of the sphere. 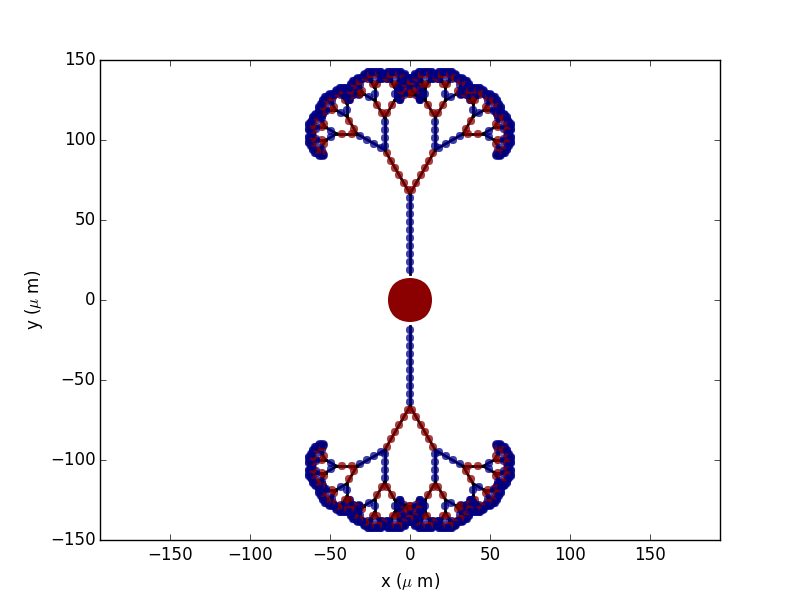 Several state variables are created automatically: the SpatialNeuron inherits all the geometrical variables of the compartments (length, diameter, area, volume), as well as the distance variable that gives the distance to the soma. For morphologies that use coordinates, the x, y and z variables are provided as well. Additionally, a state variable Cm is created. It is initialized with the value given at construction, but it can be modified on a compartment per compartment basis (which is useful to model myelinated axons). The membrane potential is stored in state variable v.
Note that for all variable values that vary across a compartment (e.g. distance, x, y, z, v), the value that is reported is the value at the midpoint of the compartment. The calculation is based on the local total conductance (not just the leak conductance), therefore, it can potentially vary during a simulation (e.g. decrease during an action potential). The reported value is only correct for compartments with a cylindrical geometry, though, it does not give reasonable values for compartments with strongly varying diameter. 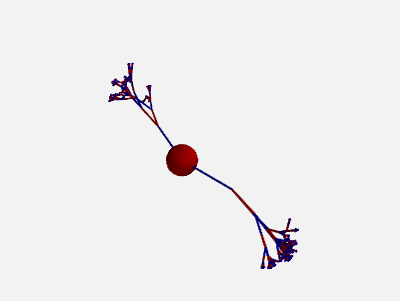 State variables of the SpatialNeuron include all the compartments of that neuron (including subtrees). Therefore, the statement neuron.v = EL + 10*mV sets the membrane potential of the entire neuron at -60 mV. Here each synapse (instead of each compartment) has an associated value g, and all values of g for each compartment (i.e., all synapses targeting that compartment) are collected into the compartmental variable gs. where m is the state variable for sodium channel activation (assuming this has been defined in the model). Here a spike is detected when half of the sodium channels are open.